This week’s Torah portion describes the debacle of the twelve spies who go into the Promised Land to scout it out and report back to the people. Ten of them report that it will be too dangerous. The people protest that they would rather go back to Egypt. Only Joshua and Caleb give a positive report. In response to their lack of faith, God decrees that the generation of the Exodus must wander in the desert for 40 years, as they are not fit to inherit the Promised Land. Only their children will have the fresh outlook and confidence necessary to carry out this mission. In this week’s Haftarah/Prophetic reading, we fast forward to the next generation. Joshua appoints two trusted spies to scout out Jericho prior to the Israelites’ conquest. This more subdued, but successful mission stands in contrast to that of the twelve spies. 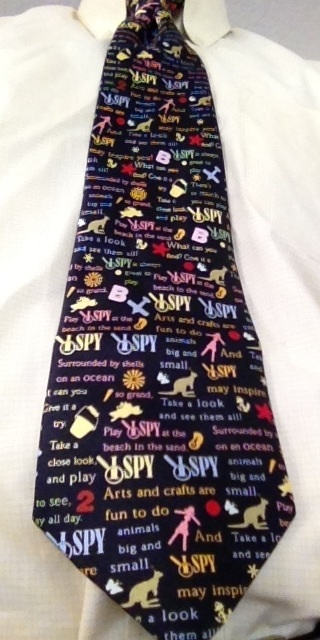 With all this discussion of spies, now you can play “I Spy” on my tie of the week.